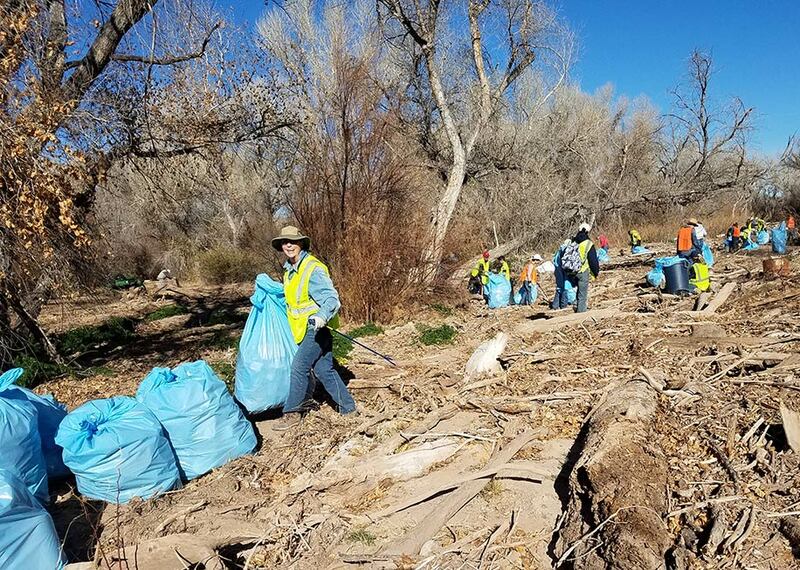 A massive riverside cleanup on Saturday, January 27, overflowed with community spirit—much like the river had flooded part of Carmen with trash. Friends of the Santa Cruz River (FOSCR), along with numerous partners, organized the event. Among other complications, this task required creating footbridges to access two football-field-sized “bottle dams.” This phrase describes the plastic trash from all over our binational watershed that gets flushed down and sieved out of summer flood flows, along with lots of downed wood that accumulates in our beautiful riparian forests. Check out this great time-lapse video of the volunteers at work! We had to plan carefully to make this event, in semi-wild and rough terrain, possible and safe. Volunteers took up advertising for help, contacting likely participants, gathering snacks and water, and arranging all the logistics and some details you don’t think about until 2 o’clock in the morning. The Anza Trail Coalition (ATC) brought help to park the 136+ volunteers who showed up from everywhere to pitch in. Five landowners gave permission for us all to tromp across their properties. The ATC and several local ranchers brought ATVs and a backhoe to help shuttle supplies out to the pickers and filled bags and tires back. The Arizona Department of Environmental Quality not only provided bags and other supplies, but also covered our insurance for the day, and three staffers from Tucson spent the morning hauling trash out with the rest of us. Santa Cruz County sent landscape trailers along with their Emergency Services Director to help everyone stay organized and safe, and waived tipping fees at the landfill. The Tubac Fire Department was also represented in our Safety Officer; these two public servants made the cleanup remarkably smooth and blessedly free from accident. Both Rio Rico’s Interact Club and Nogales High School’s Green Club came out in force and attacked the trash piles like demons, along with many other students and their families. Hiking groups, birding groups, and neighbors picked, dragged and carried all morning long, leaving tired but gratified with the difference they had made. We collectively removed over 200 tires and 2 tons of trash—mostly very light plastic. Our initial estimate is that about 400 contractor trash bags full were removed from the river environment and taken to the landfill. This trash will no longer pollute the river’s environment and will not be spread further north to sully other locations. As most folks were heading home, a few of us saw a large bird soaring overhead; we thought we saw a white head. A bald eagle was a fitting symbol for the day: the best of our United States, our community pulling together for the common good. Many thanks from to all our volunteers and supporting organizations for making the day a huge success! The river is visibly cleaner and healthier because of your efforts. YOU ALL ROCK!! Call Your Congressmen: Pass The “Nogales Wastewater Fairness Act”!